At the end of April, Windmill (all five of us) trekked down to GothamGo to learn things, meet people, and pitch our product. As Silver Level sponsors, we had our very own little table on the first floor; it was the perfect chance to pitch our fledgling product, make connections, and figure out what developers might want from us. The only question was: how? We’re a brand-new team, and GothamGo was a great excuse to do some important work. In preparation for the conference, we talked, we brainstormed, we aligned on our values and objectives and product goals; and then took the results of those conversations and ran with them, building our booth and our pitch from the bottom up. The first order of business was: what was our booth going to look like? We asked this question of the team, and immediately realized that we first had to tackle our zeroth order of business: what were our objectives for the conference? In other words, what did we as a company hope to get out of GothamGo? Our answers would shape how we interacted with attendees, and how we decked out our booth to encourage those interactions. With a framework in mind, we then turned to booth design. 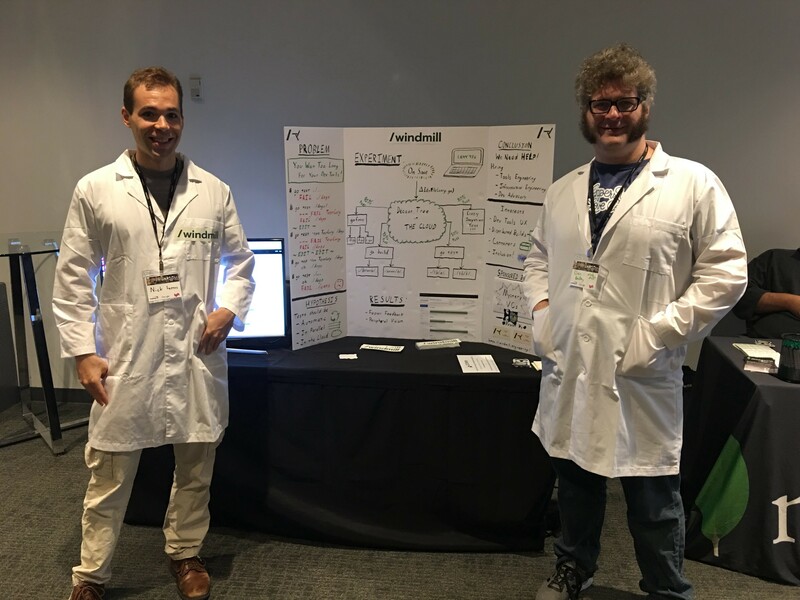 Last year at GothamGo, our founders went full science fair, with great success. This year we wanted something with a similar vibe — not a big fancy banner with our company name on it, but something more personal and more interesting. We started tossing out ideas for booth themes in keeping with these values, but the breakthrough actually came when we took a slightly different tack: rather than “what do we want our booth to be,” we considered, “how do we want our booth to hook passersby?” The very first idea that got proposed was: “let’s let people complain about their dev tools. 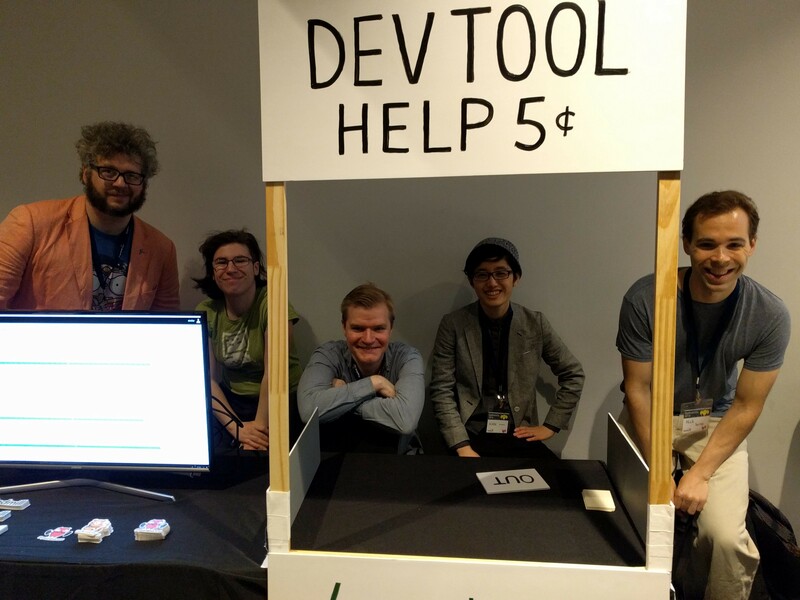 People love complaining about their dev tools.” The team loved it, and from there, it was jut a hop, skip, and a jump to Lucy’s “Psychiatric Help 5¢” stall from Peanuts. We spent some time spitballing ideas, and declared a sub-committee to come up with a more concrete proposal. (It turned out that this was a key move — brainstorming is great for generating high-level ideas, but trying to make specific decisions in a committee of 5+ is a recipe for disaster.) With the fruits of this meeting in mind, our sub-committee set out to decide exactly what the booth would look like, and what swag/shiny things/interactive bits we would have to spark conversation and move towards our objectives. …and more! In the end though, we decided to strike almost all of their proposals. The initial booth proposal. Note a handful of things already crossed out. Any of the things suggested would be great booth components and conversation starters in their own right; but all together, it was just too much! If someone came up to our booth, we didn’t want to overwhelm them with choice; instead, we wanted a booth that funneled visitors into our desired modes of interaction. 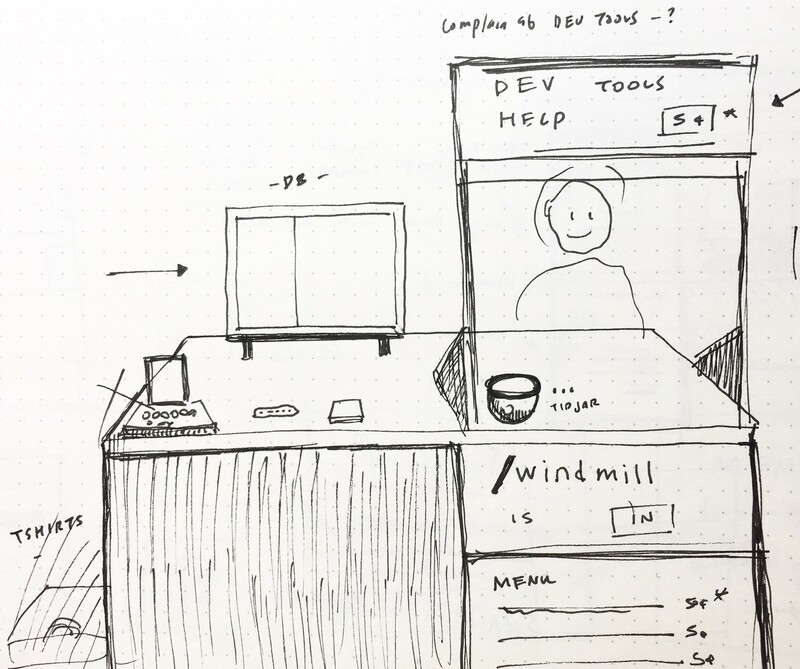 In the end, we opted to keep our booth lean, with only three major components: the psychiatry booth sign itself (“Dev Tools Help 5¢”); the screencast of Windmill Alpha in action; and a handout asking people for dev tools horror stories and directing them to our contact form. The product we’re trying to build is a little new and a little amorphous. Given that, and the fact that 40% of our team had joined within the previous months, we took GothamGo as an opportunity to align on our vision of Windmill and to practice pitching our product. Your opening line can be brief. I had previously bent over backwards trying to explain Windmill in one sentence, but to my surprise, the best pitch-starters were the shortest: say, “Windmill makes development tools that give you faster answers to better questions.” The purpose of the opening line was not to explain our entire product in one go; it was to catch interest and spark discussion. Ask your pitch-ee questions about their situation/use case. This is by far the best way to make sure you’re pitching to someone and holding their interest, instead of rambling about generic stuff that’s not of interest to them. Corollary point: probe to get at their concerns and reservations, and address them directly. If you’re feeling resistance to your pitch, figure out why — either you can address your pitch-ee’s concerns and explain how your product is in fact right for them, or you come away with a new growth area for your product. We came away from our practice session more comfortable in our pitch, and more unified in our product vision. And because of our thorough prep work — for pitch, booth, and conference objectives alike — we were able to go into GothamGo prepared, aligned, and ready to make some new friends on behalf of Windmill. Want to see the fruits of our pitch-practicing? Luckily, it’s easy to get a first-hand demonstration: hit us up at @windmill_eng or drop us an email! Thanks to Sarah Withee and Rae Krantz for their feedback on this post!